Empanadas are a Latin American classic. Consisting of pastry dough stuffed with a variety of sweet or savory fillings, they are similar to handheld pies common in other cuisines. These savory empanadas are stuffed with seasoned sweet potatoes, caramelized onions, bacon, and queso fresco cheese. Preheat oven to 350 degrees Fahrenheit. Bake sweet potatoes until tender when pierced with a fork. Remove from oven and let cool. Prepare the empanada dough according to the recipe and let rest while sweet potato is baking. Brown bacon in a large skillet over medium heat. When bacon is cooked, removed and cool on a plate. Reserve 1 tablespoon of bacon fat in the skillet, and discard remaining fat. Thinly slice the onion and place slices in the skillet with the cumin, brown sugar, and 1/2 teaspoon salt. Cook onion over low heat until dark golden brown and fragrant. Peel and mash the baked sweet potato and place in a bowl. Add the caramelized onions, coarsely chopped bacon, lime juice, and cheese (cut into small cubes). Season filling with salt and pepper to taste. Divide empanada dough into 10 balls. On floured surface, roll each ball into a 5-inch diameter circle. Place 1-2 tablespoons of the sweet potato filling in the center of the dough. Fold dough over and seal and crimp edges. Whisk egg with a little bit of water and brush empanadas with egg wash. Bake at 350 degrees until golden brown. Serve warm or at room temperature. 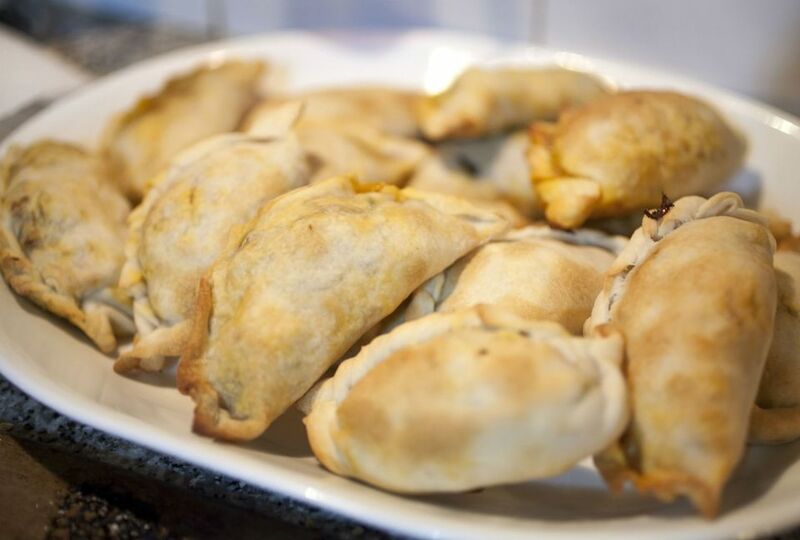 Reheat empanadas in oven or microwave.